I had an older 1977-78 Chinook that I LOVED. I'm looking for another one as had to sell it some time ago and now have the time to use one. Can you help? Sure. DT's readers can help too! 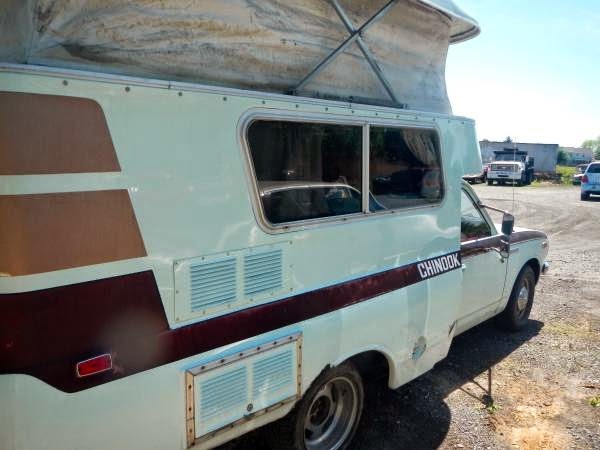 A quick nationwide Chinook search finds a few around, but this 1976 Toyota Chinook offered for $5000 in Stormstown, PA seems like a good start. It is in decent condition and just got a new Toyota 20R engine, what could be better than that? If you want to take a risk on a car without photos, there is a cheap '74 Chinook offered for $1500 in Cecil, WI that only has 34k miles on the odometer. The Toyota inline-4 should be good for another 250k!! Help find a Chinook (or suggest an alternative camper) for Laura. Comments below. Gah! I wish you'd asked about 8 months ago. There was one just over the border in Cheyenne restored to perfection for around 6k, I believe. Good Toyota Motor homes are not always for sale, but I have seen a few here in Nebraska come up over the last couple of years. You kind of need to wait around for them with an idea of what you want. Hello! This is Laura, thank you all for so much help already. You guys are fantastic! You have given me a couple of good leads already. I had seen the one in Huntington. Wherever the unit is it will have to be drivable back to Nebraska. I don't mind that! I am looking forward to a road trip with three little dogs who are camping queens! (my budget is about $3,000 tops) But I do have a four wheel drive mud rat to trade. I found one! This is Laura, I found a Toyota Keystone for in my price range. it is a 1979. A little bigger than I wanted but the price was right and I only have to 350 miles to get. It has the famous 20r engine I wanted. BUT you all probably know about the eBay "pay" scam. I ran into 2 of them. Camper so low priced that it smelled from the start. Then they don't want you to come and look at it or pick it up, just pay thru eBay. Well it would have to be sold on eBay to go thru Paypal and to get the guaranteed guaranteed five day inspection. As soon I said no, I want to come look at it and drive it home they dropped my like a hot potato. So if you haven't run into this beware. Thank you everyone for helping me! Sweet. Glad you found something. Thank you Laura for introducing me to this site! My name is rick & I have the 1974 Toyota Hi-Lux/Chinook for sale in Cecil, WI 54111. The little RV can be seen on Craigslist/Green Bay, WI. Feel free to contact my e-mail for any questions.